One of the development machines we have for MPF is a 1994 Williams Demolition Man, and we have a simple MPF configuration built for it that you can run to see MPF in action. Even if you don’t have a physical Demolition Man machine (which we assume you don’t), you can run our “Demo Man” config using MPF’s smart virtual platform. The mpf both command launches both the MPF game engine and media controller at the same time, the -X command line option tells MPF to use the “Smart Virtual” platform (instead of the P-ROC platform that the Demo Man files are configured for) since you most likely don’t have a Demolition Man machine connected to your computer right now. If you don’t see the DMD window pop up, make sure it isn’t hiding behind another window. Since you don’t have physical hardware attached, you can use the keyboard to simulate machine switch changes. At this point you can “play” the game via your keyboard. Hit the L key to launch the ball into play. You should hear the music loop change to the main background music. You can hit the X key to simulate the left slingshot hit which should play a sound effect on top of the music as well as show a score. You can hit the 1 key to simulate the ball draining and entering the trough. Then you can hit the L key again to launch the ball into play again. You can also press the S key additional times during Ball 1 to add additional players. When you play through a complete game (3 balls per player), the machine should go back into attract mode (or possibly the high score entry mode). 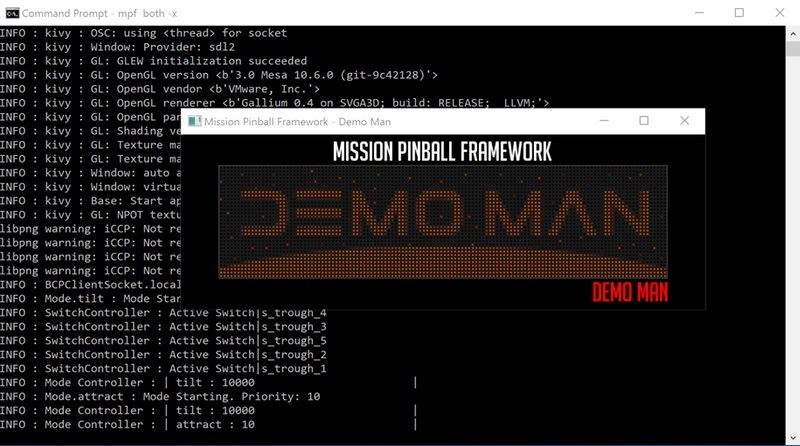 You can quit the game by making sure the Demo Man popup window is in focus and hitting the Esc key. Launch both the MPF core engine and the media controller and make sure you see the the popup graphical window with the DMD in it. Press the S key to start a game. You should hear the music loop start. Press the L key to launch a ball into play. You should her the music switch to the main background theme for the game. Press the X key a few times to simulate hitting the left slingshot. You should see the score change each time you do this. Press the 1 key to drain the ball. Repeat Steps 4-6 until you finish your game or get bored. If you get a high score, the Z and / keys are mapped to the left and right flipper buttons to highlight a letter, and the S key (start) selects it.